Primary Natural Resources petroleum, natural gas, diamonds, manganese. CÔTE D’IVOIRE (Ivory Coast) is bordered by MALI and BURKINA FASO on the north, by LIBERIA and GUINEA on the west, and by GHANA on the east. The official capital is Yamoussoukro, while the largest city and commercial center of the country is the former capital, Abidjan. The south consists of a coastal lowland with heavy rainfall, the interior of a densely forested plateau, and the north of upland savannas. There are over 60 ethnic groups in Côte d’Ivoire, the major groups being the Baoule, Beti, Malinke, Senufo, Anyi, and Dan. Of the more than 5 million non-Ivoirian Africans living in Côte d’Ivoire, one-third to one-half are from Burkina Faso, and the rest are from Ghana, Guinea, Mali, NIGERIA, BENIN, SENEGAL, Liberia, and MAURITANIA. The non-African expatriate community includes roughly 130,000 Lebanese and 20,000 French. About 60 percent of the population is Muslim (who live predominately in the north), 25 percent follow traditional religious beliefs, and 15 percent are Christian (who are mostly concentrated in the south). French is the official language. Côte d’Ivoire showed remarkable political stability from its independence from France on August 7, 1960, until late 1999. The first president was Félix Houphouët-Boigny, who remained in that position until his death in December 1993. He was succeeded by President Henri Konan Bédié, who was toppled by a bloodless coup by General Robert Guei on December 24, 1999, as falling world market prices for Côte d’Ivoire’s primary export crops of cocoa and coffee put pressure on the economy. Elections were scheduled for fall 2000 but were later cancelled by Guei, and this started a period of coups, attempted coups, and civil wars, which ended only in January 2003, when French troops intervened to broker a power-sharing national reconciliation government. Despite steady industrialization since the 1960s and a high economic growth rate from its independence through the 1970s, the country is still predominantly agricultural, which contributes 29 percent to the gross domestic product and employs approximately 68 percent of the population. Côte d’Ivoire is among the world’s largest producers and exporters of coffee, cocoa beans, and palm-kernel oil. Other exports include cotton, bananas, pineapples, rubber, and mahogany and other hardwood timbers. Among the country’s industries are the production of foodstuffs, palm oil, petroleum and natural gas (offshore production began in the early 1980s), textiles, construction materials, and fertilizer, and the assembly of motor vehicles and bicycles. 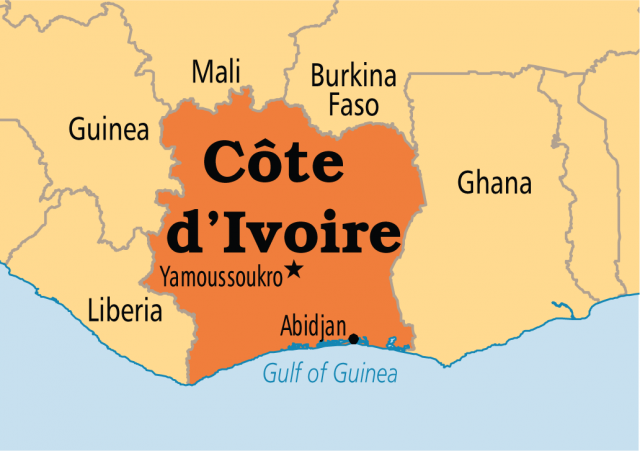 Côte d’Ivoire, or Ivory Coast, was named for the supplies of ivory brought to the coast for trade in colonial times.